Hiking with your dog sounds more stressful than it actually is. Proper planning and gear are crucial for a successful hike. It’s also important to know the rules and regulations for hiking with a small dog. For example, pets, including service animals, aren't allowed in any national parks. They’re also required to be kept on a leash at all times. 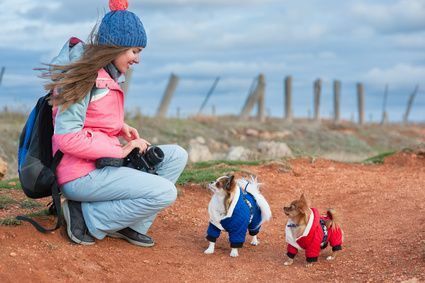 In this article, we’re going to help you feel confident and comfortable on your next adventure by covering topics from what to bring with you and how to ensure your dog is having fun on your hike to how many miles your dog can walk and how to carry them when they’ve had enough. How do you hike with a small dog? Not all dogs are created equal. It’s no secret that larger dogs have more stamina than smaller dogs, but that doesn't mean your small dog won't be great at hiking. When hiking with smaller dogs, it’s best to select a trail with lower elevation and a clear path. While smaller dogs can have as much energy as larger dogs, they have obvious physical limitations. It’s important to keep an eye out for weariness and take frequent rest and water breaks. Always remember to bring a hiking backpack with you on your hike to store all of the items you'll need. Your backpack can double as a way to carry your pup if they’re getting tired. There are backpacks made specifically for carrying dogs. You can also put them in your regular backpack and leave their head out. How to safely hike with your dog? Safety is one of the most important things to remember when hiking, especially with pets. The best way to ensure your dog stays safe is by keeping them on a leash at all times. This will help eliminate the risk of encounters with predators and help them stay on the trail. Another way to hike safely with your pet is to know their limitations. If you’ve never hiked with your dog before, start small with an easy trail and work your way up to more difficult trails. Also, take into consideration the weather and conditions of the trail. Ice, jagged rocks, rain, and snow are not the best hiking conditions for most dogs. Bonus tip: brush up on your obedience training. A dog that listens to your commands will disengage from any predators or distractions on the trail. How do you make hiking fun for dogs? While Hiking might be fun for you, it may not always be as fun for your dog. One simple way to guarantee that your dog will have fun is to let them be dogs. Let them sniff and explore. They’re exploring a brand-new environment just like you. Also, as mentioned before, be prepared. It’s easy to have a good time when you have everything you need with you. Take as many breaks as necessary to ensure your dog isn’t exhausted and being pushed too hard. Make sure you make time praise them for their hard work. What to bring hiking with dogs? Aside from the basics, there are quite a few more items you should consider bringing with you on your hike. Hikers who hike with their dogs recommend that you purchase dog hiking boots to protect their paws from rough terrain. If you’re backpacking, make sure you bring toys, lightweight bedding, and something to tie your dog down with at the campsite. You might want to consider using a waist leash so you can keep your hands free in case you need to grab a map or water. It’s a great idea to bring a flashlight to hike in the dark for bathroom breaks away from camp. Bonus tip: bring a comb or brush to check for ticks. How many miles can a dog walk in a day? It’s hard to know exactly how many miles a day your dog can walk. On average, healthy dogs can exercise anywhere from 30 minutes to two hours. Older dogs or dogs with arthritis may not be able to hike for extended periods of time. So it’s important to know your dog’s capabilities before heading out on the trail. Going for neighborhood walks is a great way to test their stamina. 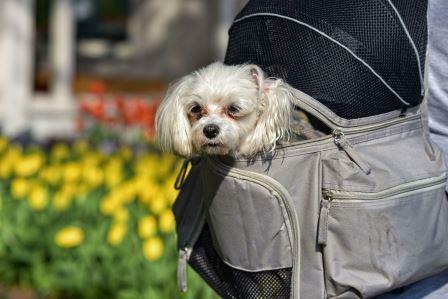 If you plan on using a backpack for your dog, test that out as well and keep an eye out for any signs of discomfort. Also, remember that if you’re hiking on a point-to-point trail you have to travel the same distance in and out. How do you carry your dog? It’s important to have a plan for carrying them if they start to get too tired or get injured on the trail. If you don’t own a carrier for your dog, you can use your own backpack, but it may not be the most comfortable or sanitary option. A few specific qualities you should look for are pockets, comfortable straps, and ventilation. Test out your pack before you go on your hike to ensure your dog will be comfortable. When can your dog use a backpack? 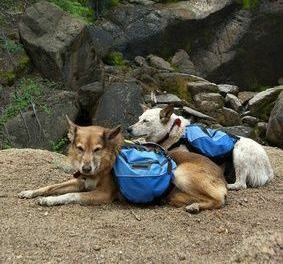 If your dog is capable, consider purchasing a backpack for them. Working breeds, like corgis, love wearing backpacks on hikes because it gives them a job to do. There are a variety of options available. Most of them fit like harnesses and have pockets on each side. As a general rule, dogs can only carry 10 to 12 percent of their body weight. You can help your dog get used to its pack by letting them wear the empty pack around the house and on walks. Slowly begin adding the items they will be carrying until the pack is full. When hiking with your dog, always remember to Leave No Trace and clean up after them and yourself. Let other hikers who don’t have dogs pass you, and don’t forget to let passersby know if your dog is friendly or if they don’t like strangers. And that’s it! Now you’re ready to explore the great outdoors with your furry best friend.